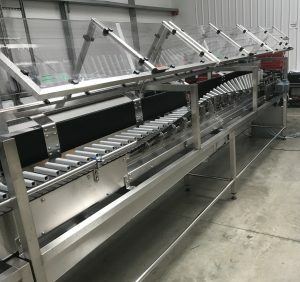 A nutritional beverage supplier in Ireland approached Asmech Systems Ltd to design, manufacture and install a conveyor system to sterilise the caps and cool the base of hot filled bottles. A typical Asmech solution for this scope of work would be our Loop Inverter. This machine accepts product which is presented from the production line and carries it around a desired belt path with standard, rubber moulded side gripper chain. Products are inverted over 360 degrees and transferred product back onto the production line. The specification supplied by the customer required bottles to be inverted by 90 degrees for a total of 3 minutes, sprayed with cool water at the base of the product and being re-inverted. This process allows the base of the cap to be sterilised whilst also allowing the product sealed inside the bottle to be cooled. Due to the specific inversion times requested by the customer, the operation could not be carried out within the standard Loop Inverter footprint. Asmech designed a solution to invert bottles by 90 degrees from vertical to horizontal, and return them to their original orientation. The bottles will need to be horizontal for a total of 11m before the turning operation. This will be achieved over 1.5m by resting bottles between rubber flights attached to the slat chain, drive in a spiralled belt path. The concept of this solution enables the line speeds and inversion time requested by the customer to be met. Why Is the Process of Hot Filling Necessary? Hot filling is a process of choice for many juices and beverages because it eliminates the need of preservatives and chemicals while maintaining the same level of shelf life and nutritional properties of the beverage. With consumers becoming more aware of potential harmful effects of preservatives, hot filling is now the obvious choice as the process is rather simple and less complex compared to it’s alternatives. Hot filling is generally suitable for fruit juices, vegetable juices, flavoured waters, and sports drinks that have a pH level of < 4.5. The process of hot filling involves several steps, each step is essential to maximise the benefits of shorter fill time and extended shelf life without preservatives. The beverage is pasteurized and heated to the hot filling temperature, generally between 190 – 203 F (or 90 – 95 C) in a heat exchanger for at least 15 – 30 seconds. This process typically kills all microorganisms in the liquid. The liquid is cooled to around 180 – 185 F (82 – 85 C) and filled at the filling station. In some cases, nitrogen is introduced into the head space (the empty space between the liquid and the brim) to remove oxygen in order to avoid oxidation. The closure is then applied immediately after. This process will sterilize the inner surface of the container. The container is either tilted on to one side or inverted to ensure the closures is also sterilized with the hot liquid touching the inside surface. The container / closure package is then brought to a cooling station (water bath or shower) to cool it rapidly, this process will help preserve the product taste and nutritional properties. The cooling process will also create a vacuum inside the container, preventing microbial growth. The cooled bottle / closure package is dried and decorating label is applied. There are many options, and considerations, when it comes to hot-filling your beverage, such as barrier properties required, UV coating to reduce sunlight reaction and extend shelf life. It is best to consult with an knowledgeable expert to find a proper match for your product. In summary, hot-filling is a good option for many fruit and vegetable juices, water enhancing and tea drinks as it eliminates the need of preservatives, while preserving ambient temperature shelf life of 6 – 12 months, and stock available hot-fill compatible containers are readily available these days making the process more feasible than before. While the aforementioned shelf life is merely an estimate, the duration is actually determined by the oxygen barrier sensitivity of the beverage, size and type of beverage bottle, and storage conditions. Essentially, hot filling is the process by which a hot liquid is injected into a container and then inverted, allowing the heat to sterilize the container and/or the cap. The liquid must be between 194 and 203 degrees Fahrenheit to ensure sterilization and requires the use of containers that do not change form at high temperatures, such as glass and certain types of plastic. The heat treatment lasts between 15 and 30 seconds, which is long enough to ensure sterilization. After the heat cycle, the content is cooled between 180 and 185 degrees Fahrenheit before being transferred to the final container (in some instances) and sealed. Cooling continues after transfer for up to 3 minutes. There are several different containers that work with the hot fill process, including glass, cardboard food containers and plastic, although not all types of plastic are suitable. Everything is made of molecules. Hot molecules move more than cold molecules, and things that are hot typically take up more space than the same things when they are cold. This means it takes fewer hot-water molecules to fill a bottle than cold-water molecules. Hot water is therefore less dense than cold water. Gravity can separate fluids by their density. Because the cold water has more mass per unit volume than hot water, the force of gravity on a given amount of cold water is larger than that on the same amount of hot water. This forces the cold water downward and causes the hot water to be pushed or lifted upward. This motion of fluids is called convection. In the set of bottles where the hot water was above the cold water, the cold water was already on the bottom, so there was no convection.